We celebrated Addison's 11th Birthday on Monday, March 25th. It doesn't seem possible that it has been 8 years since we have been able to celebrate her birthday here on earth. We know that she got to see us celebrate her special day by eating her favorite foods at Cracker Barrel and decorating her grave site with spring flowers. We miss her dearly but know we will get to celebrate special days with her again soon! The FINAL Addison Jo Blair 5K is scheduled for this Saturday. Registration is closed online but we will be registering runners/walkers Friday evening at Glendale Christian Church from 5:30-8:00 pm as well as Saturday morning beginning at 7:00 am at the church. Packet Pick-up will be at the church on Friday night and Saturday morning. We hope to see you there!!! The 8th Annual and FINAL Addison Jo Blair 5K is scheduled for Saturday, May 19th at 8:00 am. Registration is open at www.active.com. Early registration is until May 4th and the cost is $25 with the guarantee of a race shirt. May 5th the cost goes to $30 and you aren't guaranteed a race shirt in your desired size but we will do our best. More detailed information can be found on this page on the link to the right. We would love to see all those who can make it and be a part of this great event and say thank you for all of your support! If your business hasn't been contacted and you want to sponsor it isn't to late. The sponsorship form is attached. Deadline for sponsorship forms is April 25th. Thanks!! We want to say a huge THANK YOU to the Burger King restaurants in Elizabethtown, Radcliff and Brandenburg. They sold our rainbows last month in their restaurant and gave us a donation of $5,200 this year! We want to thank everyone who purchased a rainbow for $1.00 while visiting Burger King or who gave a donation. We truly appreciate all the support and we couldn't continue our mission to help those children battling cancer without you! Our daughters legacy continues to live and help other people going through similar battles as she went through because of all of the support from our local communities. THANK YOU SO MUCH!!! The 8th Annual Addison Jo Blair 5K is scheduled for Saturday, May 19th at 8:00 am. Registration is open at www.active.com. When the Addison Jo Blair 5K began in 2011 it was done by several wonderful ladies who decided to put on a 5K to raise funds for our family as Addison was in the fight of her life battling cancer. Addison was given a race shirt, the #1 race bib and a goody bag that we hung in her hospital room. It was a wonderful event that brought so many together to show their support for our precious Addison and our family. 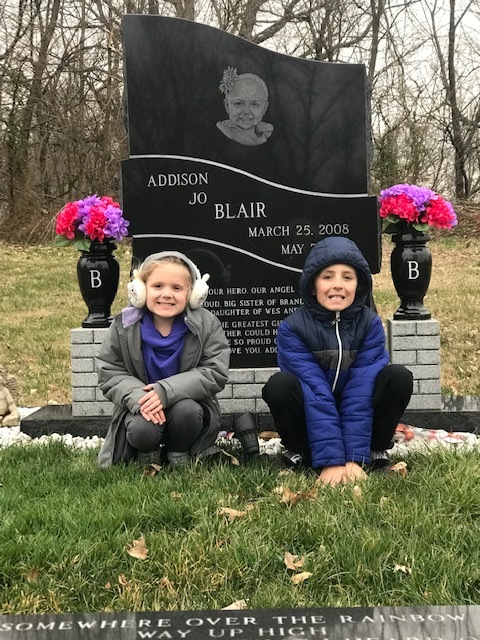 When Addison passed and our family began the Addison Jo Blair Foundation we knew that the 5K was the event we wanted to focus on and call our own. Our foundation board has ran this event for the past 7 years and we have had a tremendous amount of support whether it be in sponsorship's, participants or community members helping us out on race day. We truly appreciate everyone who has been a part of making this event run so smoothly over the past 8 years. As a board we feel that it is now time for this event to come to an end and so this will be our last Addison Jo Blair 5K event. This is not the end to the Addison Jo Blair Foundation as we will continue our efforts of raising funds for kids with cancer, assisting with the needs of the Addison Jo Blair Cancer Center at Norton Children’s Hospital and doing all we can to help raise awareness for childhood cancer. We will still be working to raise funds to help these families who are going through such a tough journey. We would love to see all those who can make it and be a part of this great event at our last 5K on Saturday, May 19th. Thanks and God Bless! 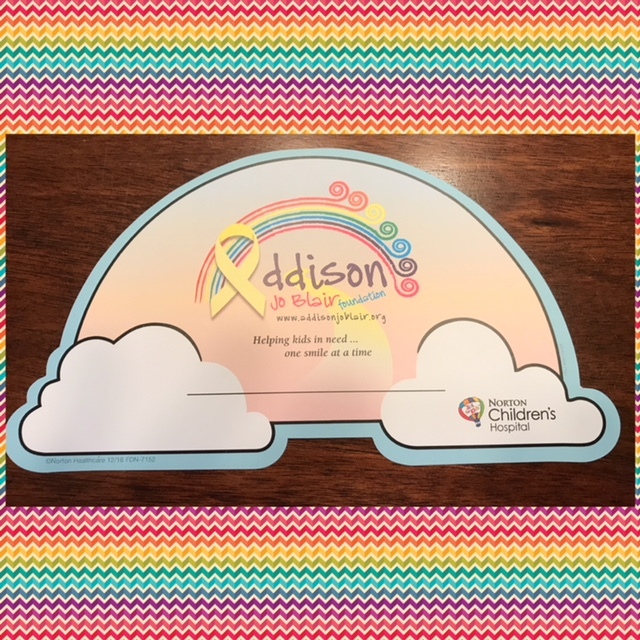 Burger King Restaurants in Hardin County (Elizabethtown & Radcliff) and Meade County are selling Addison Jo Blair Foundation rainbows from February 20th through March 17th for a $1.00 donation. The donations will support the mission of the Addison Jo Blair Foundation "helping kids with cancer...one smile at a time." All money raised will go to kids battling cancer in the Addison Jo Blair Cancer Care Center at Norton Children's Hospital in Louisville, KY. Thank you Burger King for your continued support and thank you to everyone who purchases a rainbow over the next few weeks. Your generosity will go to help the many kids and their families fighting the toughest battle...Childhood Cancer. God Bless! Hello!! We are in the planning stages for the 7th Annual Addison Jo Blair 5K Run/Walk. You can register to participate at www.active.com and search for Addison Jo Blair 5K. The race will take place on Saturday, May 20th in Glendale, KY. There is more information on this site with details such as the times of packet pick-up; race day agenda etc. The money raised will go to the Addison Jo Blair Foundation to help kids battling cancer in the Addison Jo Blair Cancer Care Center at Norton Children's Hospital. If you take a look at the About the Foundation page on our website you will see how the money raised has been spent over the past 7 years. It is truly amazing how generous and supportive everyone has been for the foundation and kids with cancer. It is a sad reality that more and more families are having to face here locally. Our mission is to support those families and help fund research so that a cure can be found as soon as possible. We thank each and every one of you for all of your support and look forward to seeing you all at the Addison Jo Blair 5K in May! THANK YOU Burger King Restaurants! We want to say a big THANK YOU to the Burger King Restaurants in Elizabethtown, Radcliff and Brandenburg. They raised $5,000 by selling Addison Jo Blair Foundation rainbows during the month of March. We appreciate these restaurants selling the rainbows and all the people who purchased one. The money raised will go towards helping children battling cancer at Norton Children's Hospital. Thank you!!!! Registration is open at www.active.com for the 6th Annual Addison Jo Blair 5K. If you have not registered please do so soon. This year we have absorbed the fee that is charged by active.com so when you register online the price is $25.00 for early registration and then $30.00 for late registration which begins May 7th. We look forward to seeing everyone at the race and raising funds for children battling cancer being treated at the Addison Jo Blair Cancer Care Center at Norton Children's Hospital. If you have any questions for our foundation please email us at info@addisonjoblair.org or send us a message on our Facebook pages (Addison Jo Blair Foundation or Addison Jo Blair Annual 5K Run/Walk). Thanks!